Philadelphia Mayor Jim Kenney has a big lead in the race for campaign cash in the Democratic primary. Candidates for city offices had to file their latest campaign finance reports Tuesday, and the records offered few surprises. For one thing, Mayor Jim Kenney has more than 10 times the amount of cash on hand as each of his challengers six weeks before the May 21 primary. Local 98, the Electricians union whose leaders are under federal indictment, continues to make its political power felt with donations to candidates for City Council and a building trades political action committee. And embattled Sheriff Jewell Williams may not have won the endorsement of his party, but he’s trouncing his opponents in the race for money. Philadelphia primary election 2019: What do you want to know? Kenney held a robust lead in fundraising over two Democrats seeking to deny his bid for a second term. Kenney, who started 2019 with $501,459 in the bank, raised $651,722 from January to March and had $655,692 as of April 1. Fifteen political action committees, including those of several local unions and Gov. Tom Wolf’s PAC, gave Kenney the maximum annual donation of $11,900 this year. One primary challenger, State Sen. Anthony Hardy Williams, raised $58,500 so far this year and had $49,078 in the bank. Williams received $11,900 from Make A Difference PAC, which has collected money from opponents of Kenney’s sweetened beverage tax. The other, former City Controller Alan Butkovitz, said he’s raised $62,075 so far this year and had $50,972 in the bank. Candidates had until midnight to file their reports.The next filing deadline is May 10, for activity up to May 6. Independent expenditure PACs, which don’t have to follow the city’s campaign finance limits as long as they don’t coordinate with candidates, are again ramping up. Four years ago they outspent the seven Democratic candidates for mayor. Local 98 gave $200,000 in January, three weeks before the indictments, to Building a Better Pennsylvania Fund, a PAC that helped Kenney win in 2015. It had $53,003 in the bank on April 1. Local 98 leader John J. “Johnny Doc” Dougherty, City Councilman Bobby Henon, and six other union officials were indicted on Jan. 30, accused of embezzling more than $600,000. They have denied wrongdoing and vowed to fight the charges in federal court. 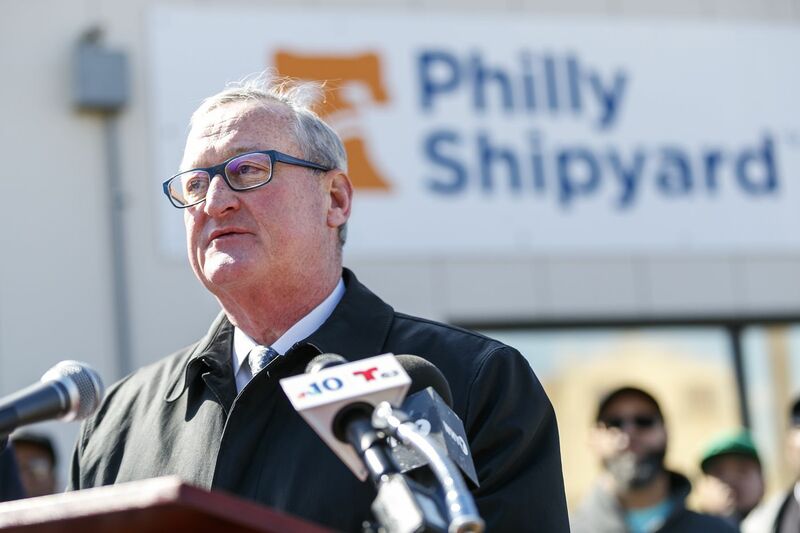 A new PAC funded by the building trades unions, Philly 2019, raised $245,000 this year and started airing television commercials in support of Kenney last week. Steamfitters Local 420 made the biggest contribution, $100,000. Philadelphia 3.0, which has focused on City Council races, started the year with $108,346 and added an additional $50,000 in January from Richard Vague, a local tech venture capitalist who has been mulling a run for president. It had $155,788 in the bank. Williams, under fire for several accusations of sexual harassment, received support from more than two dozen individuals and a few political action committees, including the Fraternal Order of Police, the Laborers District Council, and Plumbers Union Local 690. He has $36,385 on hand, about 10 times more than each of two of his Democratic primary opponents. Rochelle Bilal has $4,563 after raising $25,000 during the first cycle. Larry King has $3,062. A report for a third challenger, Malika Rahman, was not available. Williams, Democratic leader of the 16th Ward in North Philadelphia, did not get the Democratic City Committee endorsement . The city in February agreed to pay $127,000 to a former Sheriff’s Office employee who had sued Williams for harassment. Statehouse Democrats settled a sexual harassment case against Williams, a former representative, for $30,000 in 2011. A third complaint, filed by an administrative assistant in the Sheriff’s Office, is pending in federal court. Williams reported that his campaign paid him to circulate petitions, file them, and distribute posters and fliers. He got $2,181. Jamie Gauthier, former head of the Fairmount Park Conservancy, running to unseat longtime Councilwoman Jannie Blackwell in West Philadelphia, raised twice as much money as her opponent. Gauthier reported having $118,523 to Blackwell’s $52,611. She received $10,000 from Conservation Voters of Pennsylvania and $2,500 from Second Generation, which backs first- and second-generation immigrants. Blackwell got the maximum $11,900 from both Local 98 and the Laborers District Council. Sheet Metal Workers Local 19 contributed $10,000. In the 2nd District race, Councilman Kenyatta Johnson had more than $500,000 on hand, according to an unofficial tally, to challenger Lauren Vidas’ $62,548. In the 7th District, covering North Philadelphia and Kensington, Councilwoman Maria Quiñones-Sánchez reported $160,263 on hand, compared with $7,448 for Angel Cruz, who has the party endorsement. Councilwoman Cherelle L. Parker doesn’t have any challengers — in the primary or the general election — for her seat representing Northwest Philadelphia, but she has $122,696 in the bank. Most of her contributions come from five city unions, including Local 98; each gave the maximum $11,900.